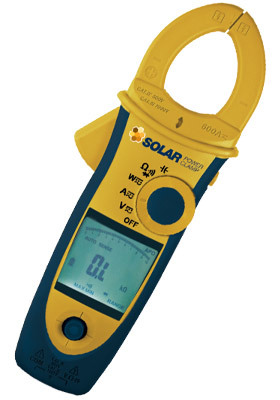 The Solar Power Clamp is a feature-packed Power Analyzer designed to enable maintenance, troubleshooting and efficiency measurements on photovoltaic systems. The Power Clamp simplifies and speeds up the process of determining the efficiency of PV systems. It can quickly measure current and voltage at both the AC and DC sides of the inverter, giving a true RMS reading of the power whilst the system is operational. The Solar Power Clamp can be used when installing a PV system to ensure the inverter is operating correctly or for maintenance and troubleshooting on the PV system after commissioning. In addition to power and efficiency measurements, the harmonic analysis function of the Solar Power Clamp can be used as a means of detecting faults within the inverter. As Solar PV systems have a lifetime of over 20 -25 years as a minimum, periodic inspection and testing is necessary to ensure that the system is working as efficiently as possible. Most manufacturers’ inverters have a lifetime much shorter than that of the entire PV system and so require particular attention as part of an annual system inspection, and testing, to ensure optimal system return on investment and power output. The Solar Power clamp is supplied with MC4 leads as standard, a set of test leads and a carry case.